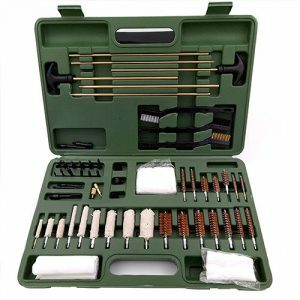 The reason why many of the gun cleaning kits get complaints is usually due to the poor quality of the cleaning rods that come with the kit. Obviously, a 32” one piece carbon fiber cleaning rod isn’t going to fit into a 8” case. 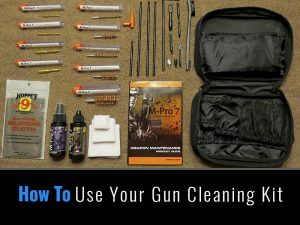 This is why most gun cleaning kits come with 3-piece cleaning rods, which many people don’t like due to their tendency to bend and often times break. 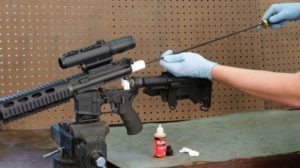 The gun cleaning rod is perhaps the most important part of any gun cleaning kit. Therefore, you will want to use the best gun cleaning rod possible to clean your firearms. 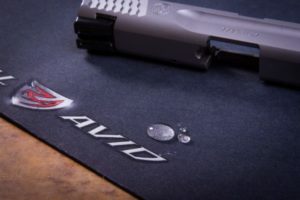 While looking at just about every gun cleaning kit on the market, we found that many of the rods were not very high quality and found many complaints about them bending or breaking. If you already have a gun cleaning kit and don’t like your rod, we’re going to take a look at the best gun cleaning rods in 2017 and see what makes them so good. We will be looking at high-quality ball-bearing swivel handles that allow you to follow the bore’s rifling. We’ll also be looking at one-piece, three-piece or four-piece rods to see the differences. Tipton makes the most popular rifle and shotgun one piece cleaning rod. Their one piece carbon fiber design has become the standard for many gun owners and a lot of people I know own all 5 lengths. The 3 piece cleaning rods that come with a lot of gun cleaning kits just don’t work as well. They are included because they fit in the small case and they have to include a cleaning rod. However, if you plan to clean your guns often they you need a good one piece carbon fiber cleaning rod. Many people say that if you can’t afford the ammo and for your gun, you should at least buy a gun cleaning kit and a good cleaning rod. Keeping your firearm in good working order is very important. The other thing we would add to that list is a good gun bore guide to help you clean your gun easier and it adds safety to your bolt guns. If you plan on using the Tipton cleaning rods then one of the best investments you can make is the bore guide kit. Basically, it allows you to avoid poking around the chamber looking for the bore. You just put the bore guide on and it perfectly aligns your cleaning rod. The bore guide is also perfect for using the longer cleaning rods designed for shotgun cleaning. This is one of the easiest things you can do to make sure you don’t damage your rifling when you’re cleaning your firearms. I actually got to test this new cleaning rod from Gunslick only a couple of weeks ago from a friend. The ball bearings are so smooth and this cleaning rod is very well made. It fit all the pieces from several different kits that I tested. Comparable to the Tipton models for the handguns, I really like the design of this one a little better than the Tipton model. The one piece carbon fiber cleaning rods are by far my favorite style of cleaning rod. We have used 2-piece and 3-piece rods and they just don’t work as well. Tipton doesn’t make a very good carbon fiber rod for handguns, so we wanted to find an alternative and this is the one. The great thing about the carbon fiber cleaning rod is that the coating doesn’t come off after scrubbing your gun. From what I’ve heard from others that have been using these rods a while, they look the same after a year. The Hoppe’s carbon fiber cleaning rod is the same price as the others and has an equally impressive design. While the other brands seem to specialize in small firearm component, such as cleaning rods, Hoppes specializes in everything gun related. After trying out this cleaning rod we were impressed with the grip. Personally, I really like the handle and the circle ball on the end makes it really easy to hold. The Handle material is a soft rubber unlike many of the plastic handles this one won’t hurt your hand and can take a pounding. Overall this is one of my favorite carbon fiber cleaning rods and it’s strange that it haven’t gotten a ton of reviews. Firearm Type: Pistols .22-.45 Cal. and Rifles .22-.26 cal. The stainless steel is polished and twists when you send it down the barrel. It’s advised to use a bore guide with this one to avoid scratching the inner barrel. The micro-polishing allows the rod to smoothly slip into the barrel a bit, unlike the carbon fiber cleaners. The coating doesn’t come off of this one and it will last a long time. This is certainly one of the best non-carbon fiber cleaning rods on the market. The last style of gun cleaning rod we wanted to add to the list was a three piece cleaning rod. Many people don’t like these as much because they can more easily bend and break than the carbon rods but oh well. 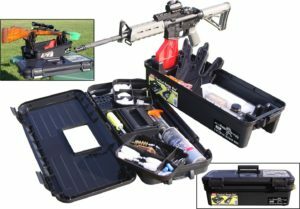 It fits well into the gun cleaning kits and if you are gentle with it, it won’t bend or break. Brass is softer than other metals and will do less damage to your barrel if you mess up. Unlike aluminum cleaning rods the brass rods are much stronger and won’t as easily break, although they may bend. While not as strong as the carbon fiber cleaning rods, you won’t find any 3-piece carbon fiber rods for some reason. The next strongest material you can use is eating stainless steel or brass. The brass also has a nice look and the hand is another that we really like this one. Overall probably one of the best 3-piece cleaning rods and I don’t know why more aren’t made out of brass. A good gun cleaning rod is required to give your gun a deep clean. You should be warned that gun cleaning rod can damage the barrel of your gun if you are not precise. Which is why the universal bore guide is highly recommended even by gun instructors. 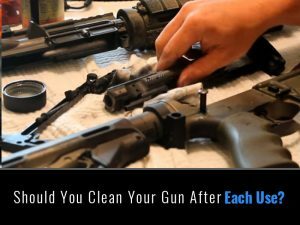 When cleaning different firearms having the accuracy to put the cleaning rods right where it needs to go can be difficult and sometimes impossible. Most serious gun owners that I talk with are using the Tipton rods and love them. They come in a variety of sizes and you should really look into these. Most people who use the Tipton rods also use the Tipton Universal bore guide. The bore guide works with most other cleaning rods but is designed by Tipton. Overall we are going to go with the Tipton rods. The carbon fiber and ball bearings make it really easy and fun to use. The Tipton Universal bore guide is a must have tool if you don’t want to scratch the barrel of your guns.